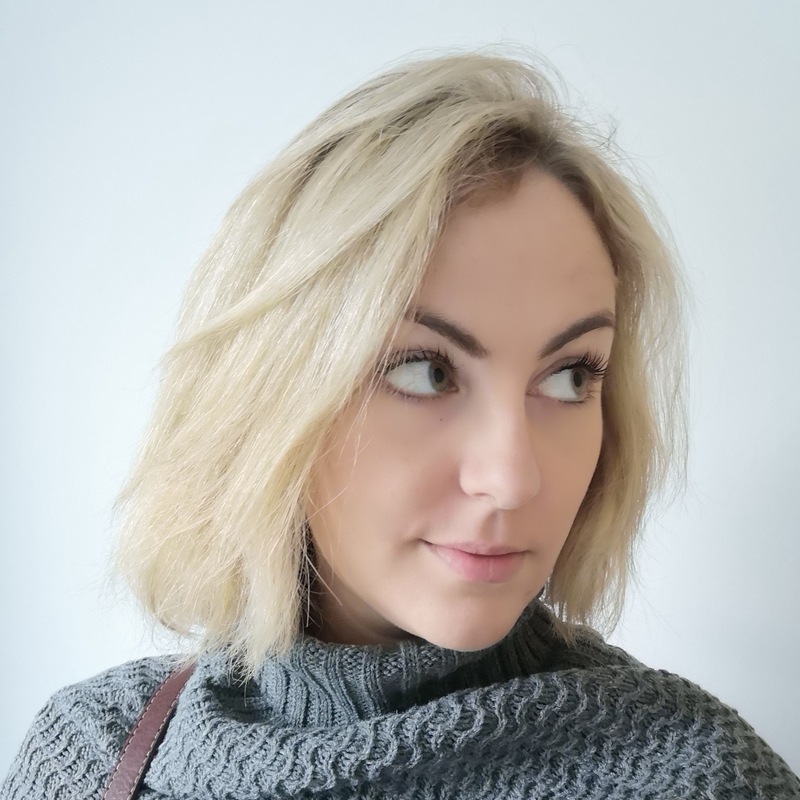 I was a My Little Pony fan as a child in the 80s, but it’s come a long way since then, with My Little Pony: The Movie and Equestria Girls full length films. There’s even a spin off series Equestria Girls: Tales of Canterlot High now on Netflix. I’ll admit that Equestria girls is something that I don’t personally ‘get’, but my daughter loves anything My Little Pony and has enjoyed watching the series. It’s about a bunch of teenage humans living on the planet Equestria, with pony ears and different coloured skin and hair, attending Canterlot High School. 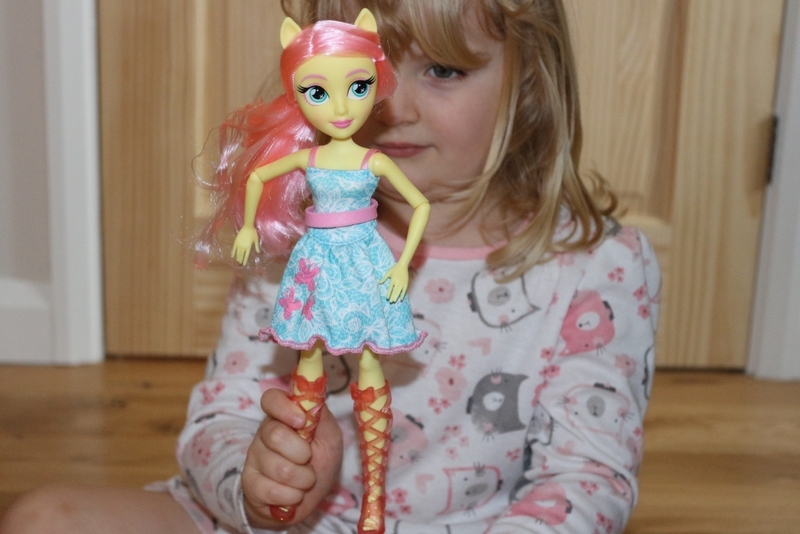 We offered to review a Hasbro My Little Pony Equestria Girls classic style doll. 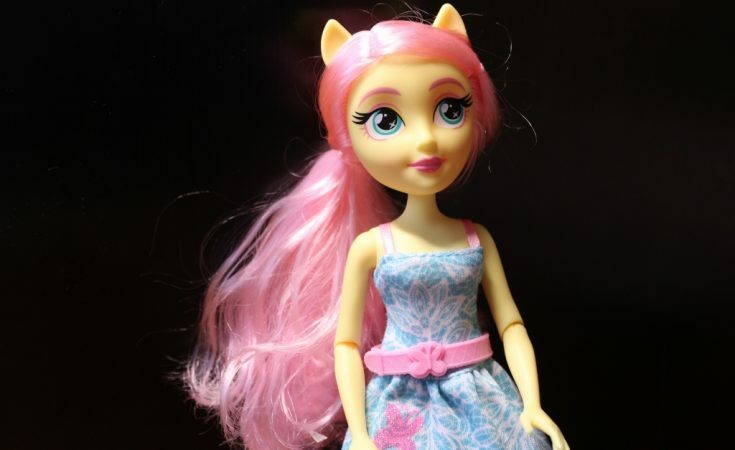 We were delighted when we received one of her favourite characters Fluttershy; a nature-loving girl with yellow skin, pony ears and pink hair. 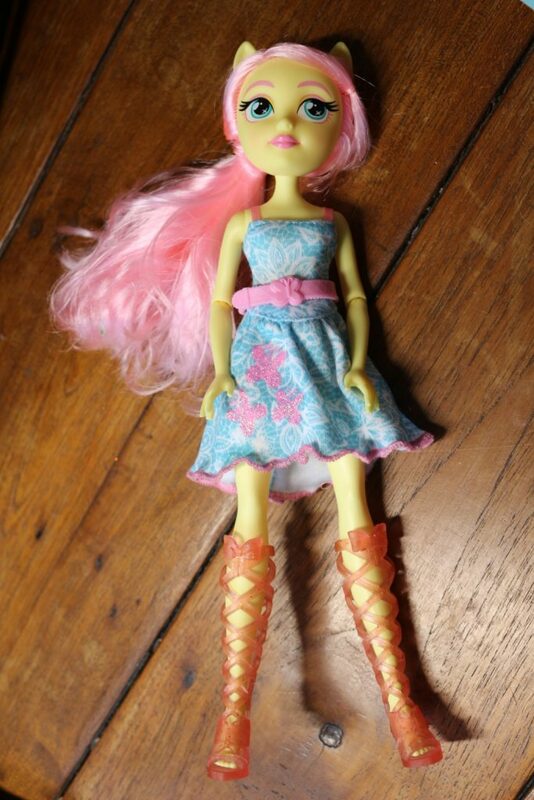 The Fluttershy Equestria Girls doll is 11 inches tall and comes with a flowery dress, pink belt and shoes. She is a bit odd looking to the untrained eye (I did wonder whether she was supposed to be some kind of alien) but if you’re into My Little Pony then you’ll love her if my daughter is anything to go by. As she comes encased in plastic, it’s not until you get her home that you can really inspect her. Her legs are hollow plastic as opposed to rubber. She doesn’t bend at the knees like some dolls can, and therefore she can’t stand on her own without support. She is however articulated on the thighs, arms, elbows and head so that you can put her in a variety of poses. 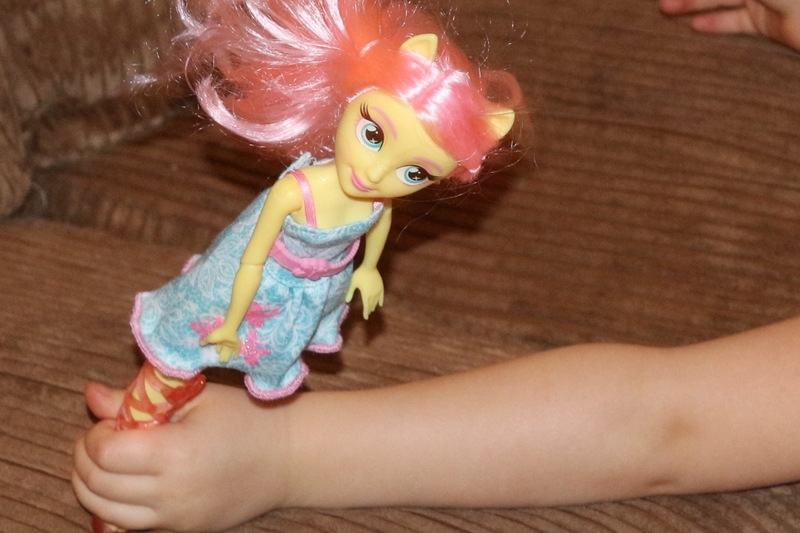 The shoes (a pair of very fetching pink knee high boots), dress and belt are fully removable and her pink hair is soft and brushable just like her pony namesake. She even has her pink butterfly cutie mark on her dress to denote her character. My daughter is very pleased with her new toy. The only question is, will she live with the dolls or with the My Little Ponies? There are seven different Equestria Girls Classic Style Dolls with an RRP of £13.99 each. 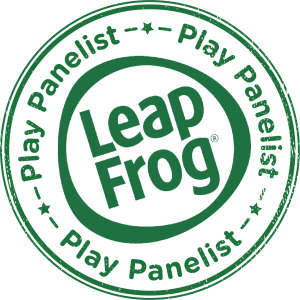 They’re available separately from good toy shops or using the afiiliate links below. 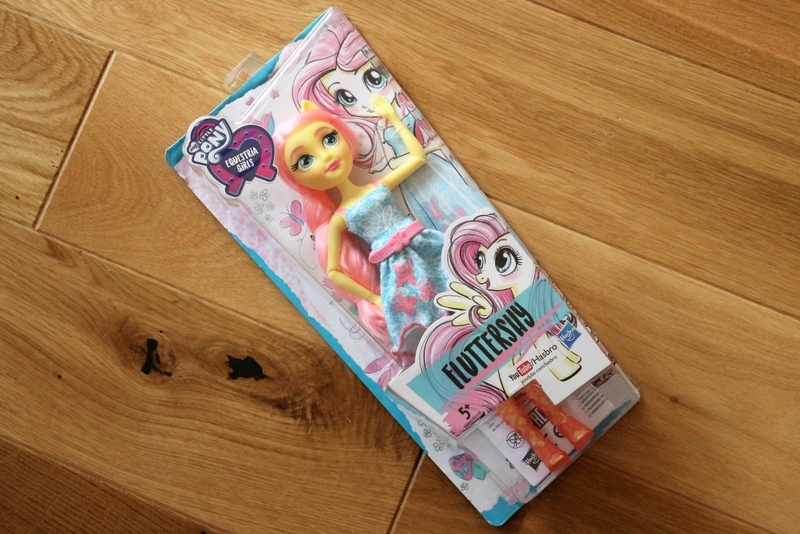 We were sent this My Little Pony Equestria Girls classic style doll Fluttershy to review as part of the Hasbro Toy Tribe. 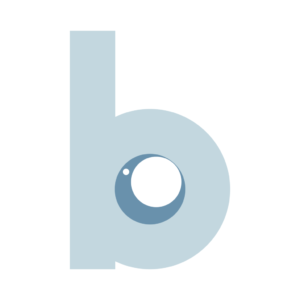 All pictures and words are my own.